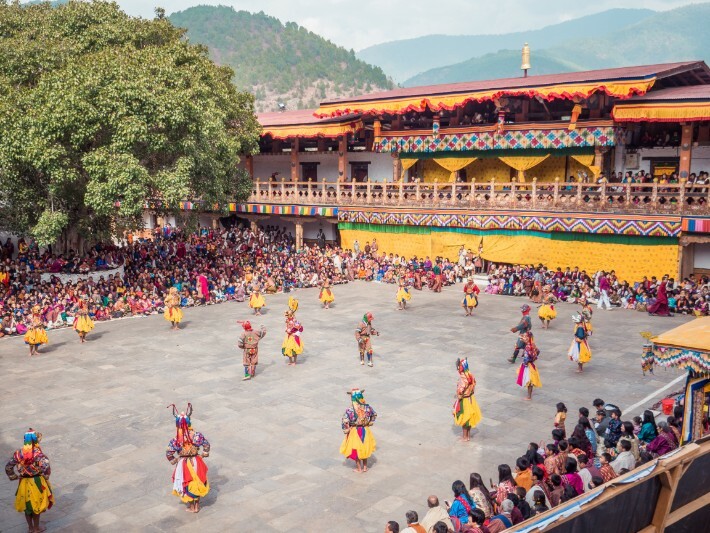 Punakha Tshechu in Bhutan – Slaying Demons & Evil Through a Dance? 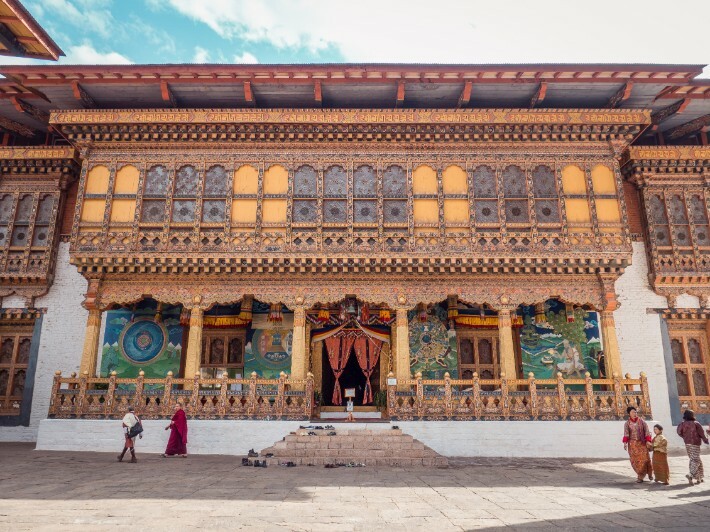 Home » Punakha Tshechu in Bhutan – Slaying Demons & Evil Through a Dance? Returning from Bhutan almost a month now, the effect the country has on me still reverberates within me. I don’t know if it was the culmination of the book I was reading about helping trafficked children in Nepal or living in such close proximity with the locals and witnessing their simple joys through my homestay there, but I’ve returned to Singapore more aware of the effects our actions have of the Earth, and I could feel the compassion within me surge. I would reject an old lady selling tissue paper in the hawker centre and then be overcome with guilt that I can’t even do a simple act of offering a dollar to her. I would order my takeaway tea during lunch breaks and then regret instantly for I’ve just unnecessarily contributed to the Earth’s depleting resources. I would be visiting a small gypsy village in Indonesia and wishing I brought my old toys to replace the bear with a broken ear and the Barbie incapacitate doll. I’m re-evaluating the kind of travelling that I’m doing and constantly asking myself how I am making a difference. 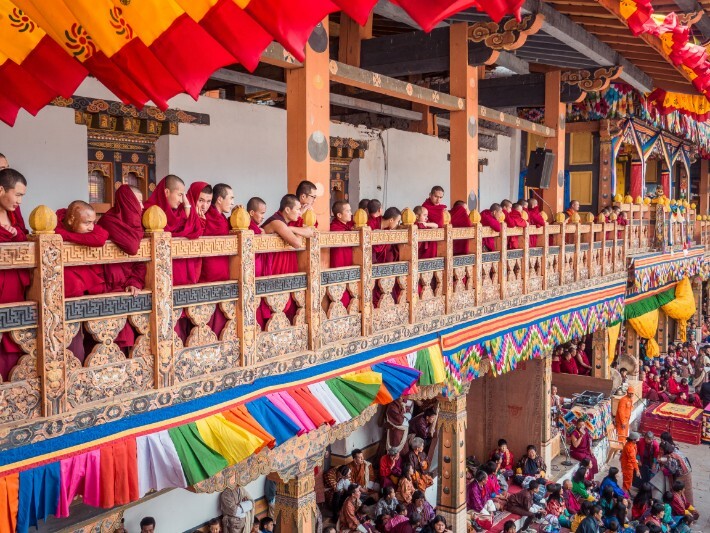 While I’m still working my thoughts out, this post today is a little insight into one of Bhutan’s grandest festivals that I was fortunate to be there for. Our agenda of the day is clear – we are going to immerse in the atmosphere of one of the largest festivals of Bhutan – the Punakha Tshechu. 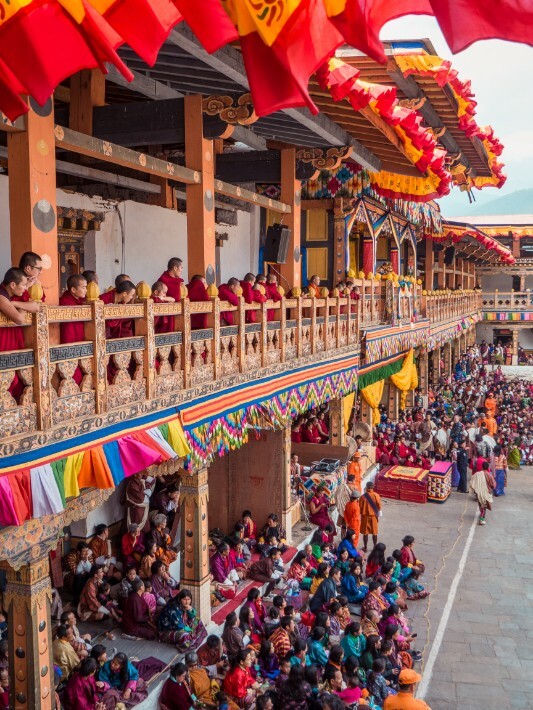 It is a day dedicated to Guru Rinpoche, with performances going on all day that reenacts the Tibetan invasion of Bhutan in 1639. We are also going to dress our part for it, no less! A dzong is an enormous fortress which houses the official monk body, government offices and several temples. 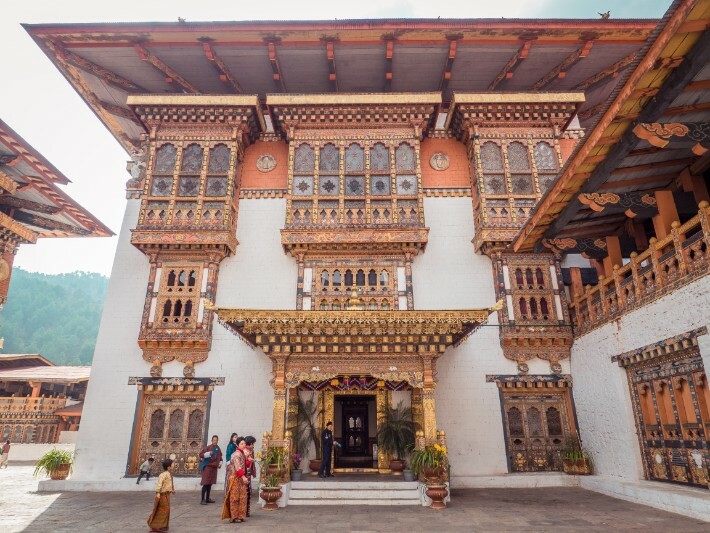 Unlike temples and monasteries that account for more than 2000 all over Bhutan, there exists a single dzong in every major city of Bhutan. It’s almost akin to a central governing body of each major city. 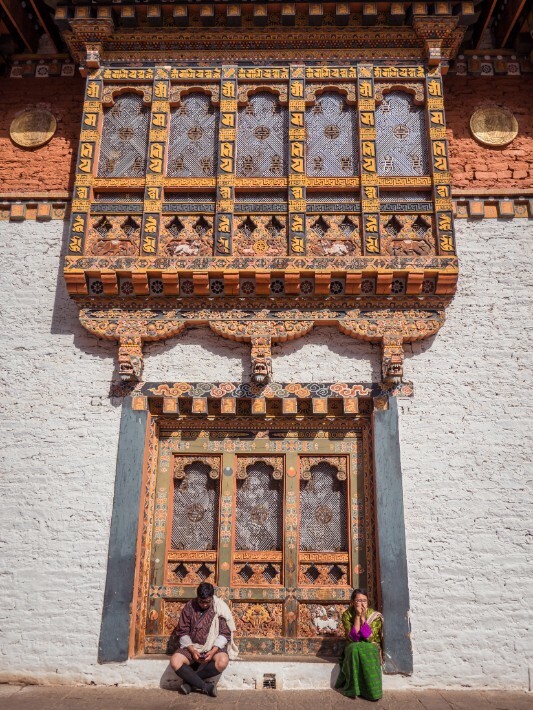 Most dzongs are built in the 17th century. 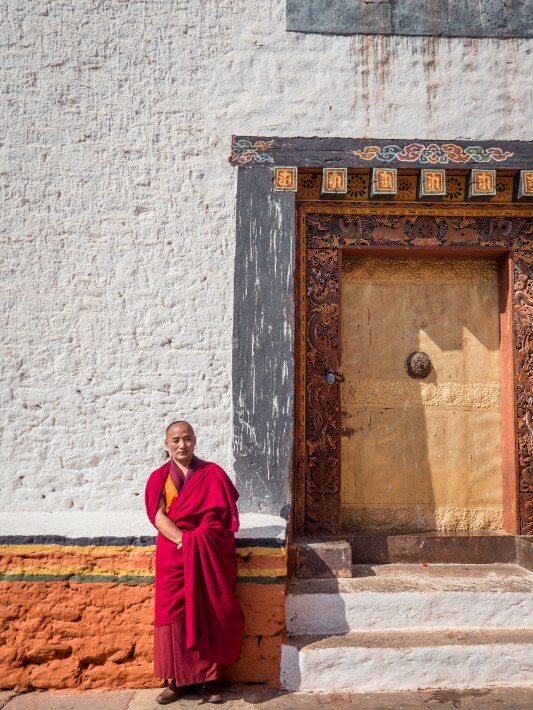 To enter a dzong, one must be properly dressed. This means: head uncovered, men with a 3-metre-long kabney (scarf) draped over the left shoulder and knotted at the side; and women with a shorter woven sash with fringed ends called a rachu draped over the left shoulder. The colour of the men’s kabney indicates their rank. Normal citizens wear white, senior officials wear red, ministers wear orange, National Assembly members (chimis) wear a blue stripe and county headmen wear white with a red stripe. The King and Je Khenpo wear saffron-yelow kabneys. 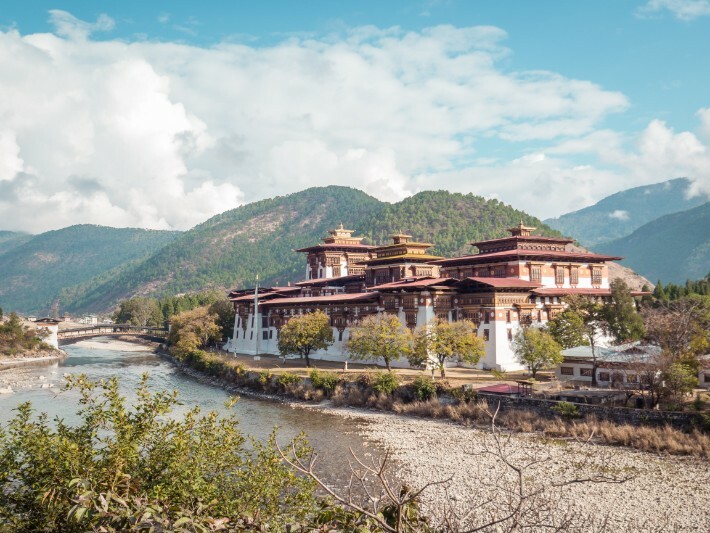 Framed against a row of jacaranda trees in full purple bloom in spring, wrapped in the fragrance of incense and juniper smoke and encircled by 2 clear rivers, Punakha Dzong is the most imposing and beautiful example of Bhutanese architecture in the country. 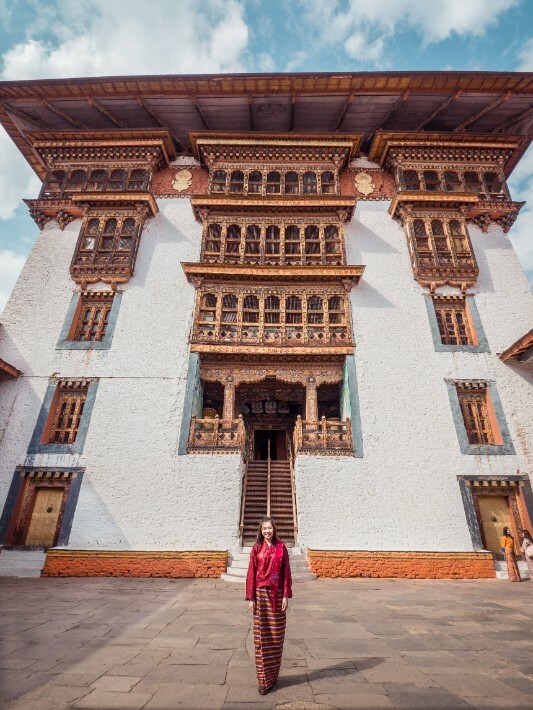 Punakha Dzong was the place where Bhutan’s first king, Ugyen Wangchuck, was crowned in 1907. It was here too that the first session of the National Assembly of Bhutan was held in 1952. At 55 metres, the cantilever bridge over the Mochu River leading to the Punakha Dzong is the longest unsupported span in the traditional cantilever architecture in the world. It’s a clever mix of traditional design and modern technology – to think it was first constructed in the 17th century! A tshechu is a festival that is held on the 10th of every lunar month. Tsechus are a series of ritual religious dances (cham) performed by spectacularly masked and elaborately robed dancers. Historic battles between the Bhutanese forces and an invading Tibetan army are more often than not re-enacted in this dazzling display of horsemanship and swordplay. The cham dances combine powerful religious rites and tell ancient stories. It’s interesting to witness masked characters enacting different sequences to the tempo of traditional Bhutanese music. Who is Guru Rinpoche and why is he so important? Guru Rinpoche is a historical figure who was born in present-day Swat Valley of Pakistan, and became a renowned sage in both India and Tibet. In AD747, legend has said that the great Indian saint and teacher Guru Padmasambhava i.e. Guru Rinpoche flew to present day Tiger’s Nest on the back of a tigress to subdue a local demon; afterwards, he meditated there for 3 months. He performed many miraculous feats throughout Bhutan and won people over to Buddhism. Today, Guru Rinpoche is revered in Bhutan as the 2nd Buddha, and there is no temple or monastery in Bhutan that doesn’t have an image or statue of him. The Punakha Tshechu is essentially the celebration of the 2nd Buddha, Guru Rinpoche’s birthday. Performed in the dzong’s courtyards, it is one of Bhutan’s grandest social event. Everyone is wrapped in a holiday atmosphere on this public holiday, where locals will take this opportunity to dress their finest clothing and don the best jewellery. Mesmerising dance dramas that honour Guru Rinpoche are performed by monks and layman dressed in colourful medieval battle dresses and painted masks. 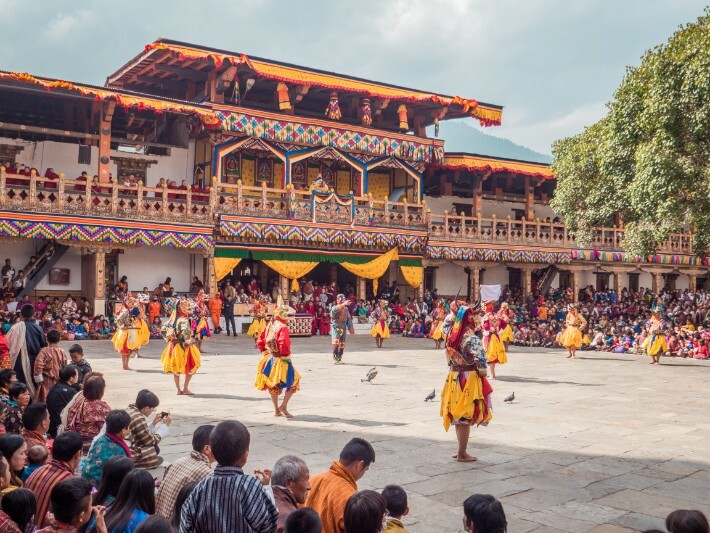 The dancers will take on roles of deities, demons, heroes and animals, and these performances are the Bhutanese’s ways of worshipping buddhas and deities. At the grand finale, it is always usually a ceremony of special homage to the Guru, when life-size images of him, representing his 8 different manifestations, are brought out in a spectacular procession, no doubt with great pageantry and dramatic flair. This is often heralded by a troupe of musicians playing horns, oboes and drums to accompany this monumental occasion. It is surely an entertaining way to be immersed in Buddhist teachings. A sense of warmth fills me while watching families enjoy the festival. It is a day where young children and the elderly alike don their colourful traditional ghos and kiras, enthralled by the dances and receive blessing from the monks. 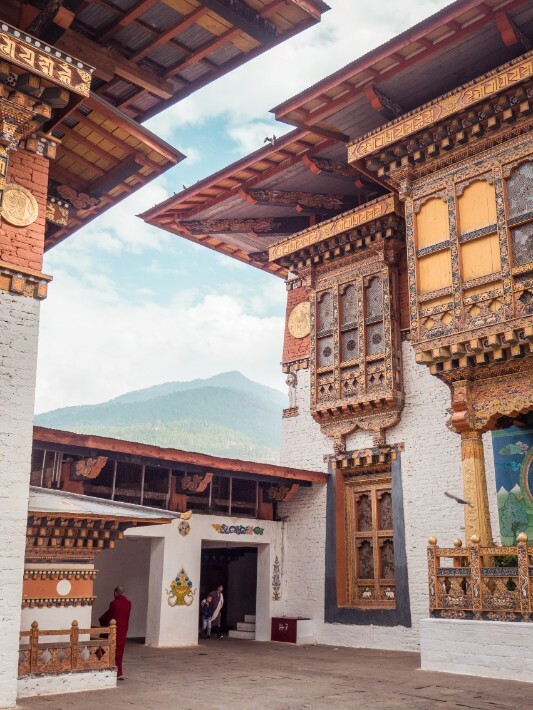 The huge part that religion and culture play in the lives of the locals reminds me of why Bhutan is the happiest country in the world, and the intentional steps that the country takes to preserve their unique culture. As it was a day-long festival, we didn’t stay long enough to witness the whole performance. We were pretty clueless as to what was happening during the performance and wish we had an interpreter to interpret the meanings of the various dances to visiting tourists like us who weren’t too familiar with Bhutan’s legends.